Threepointplay: 2014-15 Immaculate Collection: Decisions, decisions. 2014-15 Immaculate Collection: Decisions, decisions. One the highlights of the 2014-15 basketball release schedule has landed. The third edition of the high-end Panini Immaculate collection (which competes with Flawless & National Treasures as the top release) is in stores today. Ignoring for a moment the mechanics of getting the boxes to Amman, it is the price point of $530 for a box containing six cards, that immediately takes me out of the market of breaking any boxes. It is simply outside of my budget. Even if I did haver the available funds, I would then be faced with the strong possibility that the value of the cards I pull, would be significantly lower than the money I have spent on the box. I have never been a gambler (the total number of lottery tickets I have purchased and bets I have placed in my life, I suspect barely reaches double figures), meaning that in order to mitigate that risk, I would be faced with having to open a couple of cases, at a cost of over $5,000. So the nearest I will get to breaking a box, will be watching a few breaks on YouTube! I will though be looking to pick up some singles on the secondary market over the course of the coming months. 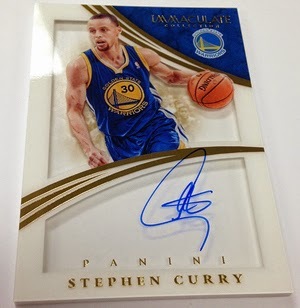 As I have stated, I am in the minority that I am not a huge fan of memorabilia cards, and will not go near sticker autos. So this quickly removes a swathe of cards from the release for me. — Dual / Trio / Quad Autographs. First two — which are on-card autographs — and in particular the Shadowbox Signatures set, as opposed the remainder which are their cut-out cousins, appeal the most. But any of seeing the prices on eBay, I see the have not ruled any out as yet.